Who even needs Red Dead? Well, we would like it, please. But these will help pass the time. You've probably noticed that Red Dead Redemption 2 isn't out on PC. "Who even needs it anyway?" we say, holding back the extremely real tears. "It's just GTA with horses," we yell, like that idea alone isn't amazing. This doesn't mean you can't source alternative western experiences on PC, though. You might not find animals you can realistically skin in this list, or long monologues from gruff men on horseback, but you'll still find plenty of fun interpretations of a western setting on PC. Below, we've collected some games and mods that might be of interest. One of the funniest games in years on PC, and indeed the recipient of our Comedy GOTY award last year, West of Loathing is a clever spin on traditional RPGs whether you're interested in a western setting or not. The tone is set when the game asks you to choose from three classes: Snake Oiler, Cowpuncher and Beanslinger. This is a world that features goblins and skeletons, so it's probably not quite as true to the Old West as Red Dead is. Nonetheless, it's absolutely full of genuinely good jokes to discover—taking a curious approach in picking apart its environments and talking to strangers is always rewarded. This awkwardly-named top-down shooter might remind you of Hotline Miami, with more of a focus on ammo conservation, careful shooting and stealth. You have to raise your gun with the right mouse button then fire with the left, then hit 'r' when you want to reload. If you're out of bullets, you can chance it with a knife by popping out from behind cover. The rhythm of the combat captures that feeling of a Wild West duel gone south, where everyone's firing at each other at once in a saloon or a barn. Its pretty black, white and red colour palette also makes it look like someone meticulously brought its world to life on a notepad in biro. "The sun is setting on the Wild West," is how Crytek describes the setting of this part survival game, part competitive FPS, which is slightly more of a horror-themed game than it is a western. The designs of the bounty hunter characters and weapons, though, are pretty appealing if you enjoy this sort of backdrop, and don't mind an infusion of supernatural enemies. The game's currently in Early Access, and getting a new post-Civil War-set map next week—Lawson Delta, which we covered earlier in the month. The original Call of Juarez is alright, too, but we’ll recommend the sequel, Bound in Blood if you only plan to play one. (Just don’t make the one you play The Cartel. That one was bad.) Call of Juarez is no Red Dead, but the straightforward 2009 action game isn’t chopped liver, either. The graphics are worn, but if you like games like Medal of Honor: Allied Assault then your 10 bucks won’t go to waste here. It’s simple—move to objective marker, shoot all the dudes on the way—with a somewhat awkward mouse-controlled cover system, but it’s a fun, bloodsoaked treasure hunt nonetheless. 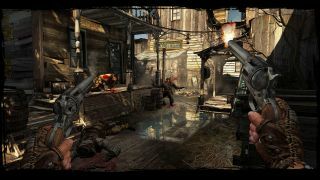 Diverging a bit from the other Call of Juarez games, Gunslinger is an arcade-style cover-to-cover shooting gallery that throws out points for headshots and combos. It’s set in a still-attractive comic book-ish looking west and tells a tall tale that involves run-ins with the frontier's most infamous shooters—but mostly in voiceover that doesn’t get in the way of shooting. It’s got a slow-mo bullet time mode as well, which isn’t radical or anything, but throws an assist to the larger-than-life gunplay the game nails. Just as Gore Verbinski's animated Rango is one of the most underrated western movies of the past decade, Stranger's Wrath is an overlooked western game that infuses the genre with Oddworld's delightful brand of weird. The outskirts setting is filled with dusty shantytowns and anthropomorphized redneck chickens. Stranger's a great Eastwood stand in as a growly bounty hunter (capturing enemies alive or dead is a great western touch). And unlike most western games, which attempt to slavishly recreate 19th century guns, Stranger's living ammo types are wildly creative. Stunkz send your enemies into vomiting fits, Stinbees home in on your targets, and Chippunks distract them by incessantly mouthing off. Not your typical western, but great all the same. A twin-stick shooter that’s best with friends—co-op story and arcade or versus—A Fistful of Gun pits you against bandits in mild bullethell (bulletheck?) arenas. What makes it special are its 11 characters, each with unique weapons and control schemes (some of which are improved by a controller). One of our favorites is Tao, who lays down fused rockets which go off on a timer and can be relit if he runs back over them, but can be destroyed by other projectiles. It takes a while for the fuses to burn, so Tao typically starts a game by circle-strafing the map laying chains of small and large rocket launchers pointing at the center—it’s a nice spectacle when they all go off in order, but still a real challenge to hit anything. A brutal sidescroller with a great soundtrack and a cute ‘luck’ system. Collect luck to encourage fortunate events, like a shot missing you or a miraculous platform saving you from a failed jump, but deplete too much luck and stuff might fall on you. Like windmills, say, which is one of the first things that happened to us when playing. Luckslinger requires the patience of classic sidescrollers like Mega Man, where redoing bits, and then redoing them again, and then again a few more times because you keep forgetting to dodge roll after jumping over that one damn gap, is just the way it’s played. This rootin’, tootin’, lots-of-shootin’ mod for Half-Life 2 is now a free standalone multiplayer game on Steam. It’s fast and frantic western deathmatch and team deathmatch, and features tons of guns, from Derringers to sawed-off shotties, and even bows and arrows. Your old timey guns take a while to reload, though, so don’t forget the old standby and kick a few cowboys to death (or chuck one of your empty guns at them). Nicely, you can choose which hand to hold your gun in, and dual wield any two guns you want. There’s even an offline mode for practice with bots. Read more about it here. Don’t let the cute pixel graphics fool you: Westerado is a sprawling open world Western with plenty of gunslinging, exploration, side-missions, and a grim tale of revenge at its core. As you attempt to track down the man who murdered your family, you piece together a portrait of him though conversations and interrogations. The best parts of Westerado: at any point you can pull out your gun and accuse someone of being the murderer, you’re free to shoot absolutely anyone at any time (though there will be consequences), and when you start a new game, the man you’re hunting is randomized, meaning it’s a different experience every time you play. Its turn-based tactics are flawed, as Tyler detailed in his review, but for frontier storytelling and atmosphere, Hard West is a good pick. Witcher 3 composer Marcin Przybyłowicz’s soundtrack along with a gravely narrator spin a fun but by-the-book acid western, in which demonic forces haunt a cast of downtrodden settlers across several storylines. Plus, you can ricochet bullets off of metal, which is one of the main things people did in the old west, we think. It’s at least a skill that’s highly underrepresented in western games. A hefty reworking of Doom’s graphics sets the whole thing in western-themed maps, with saloons, lurking vultures, and looping reprises from the Good the Bad and the Ugly theme. It’s a standard keycard hunt within fun little old west towns, and it can be pretty damn hard. The effort that’s gone into this WAD makes it a must play for anyone who enjoys exploring Doom's creative scene. If you want to use the modern WASD + mouse controls, backup DEFAULT.CFG and replace it with MOUSE.CFG. Then just run your dosbox shortcut. If you’re using a different version of Doom and play WADs regularly, we'll assume you've got this all figured out. The edges are rough—some of the medieval language still shows through—but a lot of love has been put into recreating the old west in Mount & Blade. We’ve mostly played around in custom battles, and while they tend to devolve into a sloppy mess, there’s at least a good afternoon of fun in running 100 v 100 battles between the 1860 Federal Government and western outlaws. Download it here, and install it by unzipping the folder into Mount and Blade’s ‘modules’ folder. Then just select it in the game launcher. LucasArts released its western FPS back in 1997, built on the modified game engine they used for Star Wars: Dark Forces. As a retired U.S. Marshall, you return home to find your wife dying and your daughter missing, and embark on a mission of rescue and revenge. The shooting is great (or was, for the 90's), the soundtrack is fantastic, and the story is told between levels—each ending with a tough-as-hell bulletsponge boss—via stylish animated cutscenes. You can find Outlaws on GoG, bundled with a small expansion pack containing additional missions. Made during a Ludum Dare jam event back in 2015, this free prototype has your character running on the top of a train and engaging in a bit of rock, paper, scissors against various enemies. It's very straightforward to play—you need to pay attention to the timing of the music and enemy patterns—but it's a cool little idea, with nice pixel art and animations. It was supposed to become a full game called Rhythm Ranger, which doesn't seem to have materialised. Still, this remains an impressive result of three days' work. If you want more free game jam projects with a western theme, check out the Itch.io pages for the space cowboy jam and the mystic western jam.